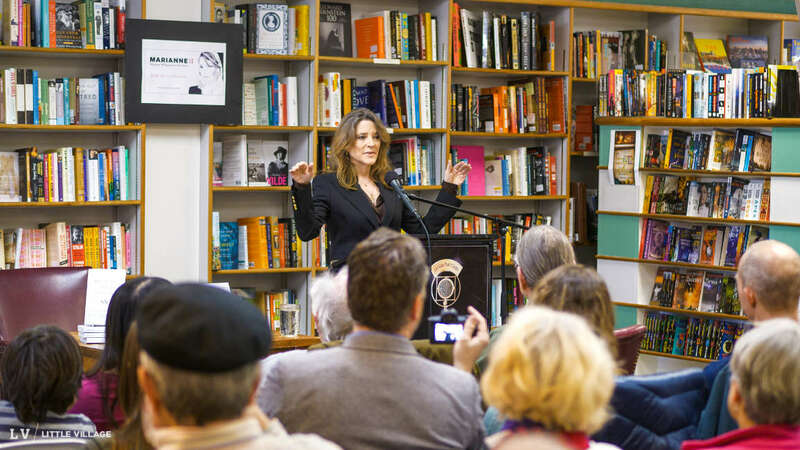 Marianne Williamson isn’t a traditional political candidate, but like a veteran politician, she began her campaign event at Prairie Lights Bookstore on Saturday with a joke. Williamson is a best-selling author, and has written many books that emphasize the spiritual aspects of a range of topics including weight loss (A Course in Weight Loss: 21 Spiritual Lessons for Surrendering Your Weight Forever), personal finance (The Law of Divine Compensation: On Work, Money and Miracles), relationships (Enchanted Love: The Mystical Power of Intimate Relationships) and politics (Healing the Soul of America: Reclaiming Our Voices as Spiritual Citizens). She was a frequent guest on The Oprah Winfrey Show, and lectures widely. Williamson said the “shallow thinking” of the political establishment, which since 1980 has been focused on short-term gains, is largely responsible for the present state of government dysfunction, and “is not the mindset” that will improve conditions in the country and the world. And it won’t be politicians alone, regardless of their mindset, that will correct the problems, according to Williamson. That will require the full participation of citizens as well. “We know what we have to do externally, and when it comes to the external things to do to address such issues as climate change, to address such issues as wealth inequality, to address such issues as student loan debt, to address such issues as health care,” Williamson continued. I’m a pretty straight-line progressive Democrat. I think we need a $15 minimum wage, we have to have universal health care, we have to have education that goes all the way through. I think we have to have education that goes beyond that — so that it’s beyond college, so that there’s a major infrastructure and matrix of technical schools and so forth. We have to do everything possible to fight climate change. And, of course, we have to defeat Donald Trump. But any policy solutions have to be conceived at a moral and spiritual level to be effective, Williamson told the crowd. Williamson said her background has allowed her to identify “four main problems, morally and spiritually” that are creating the current level of political dysfunction. The second problem she listed was “collective child neglect,” by which she meant the under-funding of public school, the experience of children growing up in violent neighborhoods and the chronic food insecurity many children live with. The third problem, Williamson explained, is the state of racial relations in the United States. 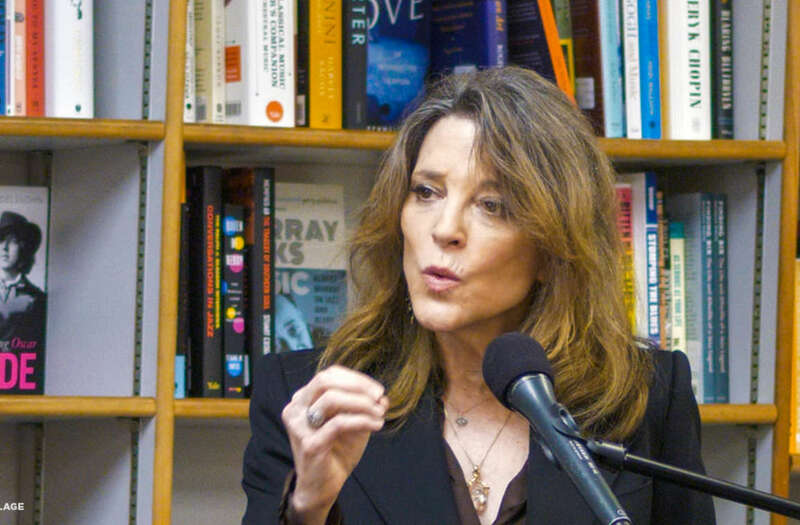 “I do not think the average American is racist … but I do think the average American is woefully under-educated about the history of race in the United States, particularly since the Civil War,” she said. In addition to people achieving a better understanding of American history. Williamson called for the federal government to pay reparations to black Americans for slavery. Williamson explained that from a spiritual perspective, both individuals and nations “have to atone and then make amends” for their transgressions. She cited the examples of Germany paying reparations to Jewish organizations and the U.S. government paying reparations to citizens of Japanese descent who were interned in camps during World War II. “I believe anything less than $100 billion [for reparations] is insulting,” Williamson said. She pointed out that amount is far less than the more than $700 billion the country spends annually on the military. Williamson said paying reparations would be good for all Americans: “We are still taking the toxic, karmic burden of this lack of racial reconciliation and handing it down generation to generation to generation.” That burden will remain, she said, until the country takes actions to atone. Williamson’s message was warmly received by the Iowa City crowd, who gave her a standing ovation at the end of her 45-minute-long prepared remarks. But the limits of her approach to politics quickly became apparent as she took questions from the audience. In response, Williamson mentioned the immigration attorneys in her family (her father and brother), the immigrants in her family (all four of her grandparents), before moving onto the spiritual and moral aspects of the issue. She did not explain what her policies on immigration, DACA recipients or border security would be. That was typical of the whole 45-minute question and answer session. Williamson did not offer specific policies, but instead spoke repeatedly of moral and spiritual dysfunction. It’s an approach that distinguishes her from major candidates for the Democratic nomination, such as the four members of the U.S. Senate — Elizabeth Warren, Kirsten Gillibrand, Kamala Harris and Cory Booker — all of whom have put forth detailed policy proposals on a variety of important issues. Williamson acknowledged that distinction near the end of her remarks. I live in Charleston, SC and I’m a member of the Jewish Community here. I agree with you on so many points. For a while I’ve called myself an independent because I’m a frustrated Democrat. For a number of years, I’ve felt that the Democratic party has abandoned the concerns of the Jewish people. I’ve noticed them backing and believing the Palestinians over Israel on so many occasions that it scares me for our well being in the future. Just recently I heard Elizabeth Warren, Kirsten Gillibrand, Kamala Harris, Cory Booker and Bernie Sanders refused to give aid to Israel in a proposed bill. What is your opinion on Israel and how do you feel on giving them support if needed. That matters to us a great deal to Jewish people living in the United States.